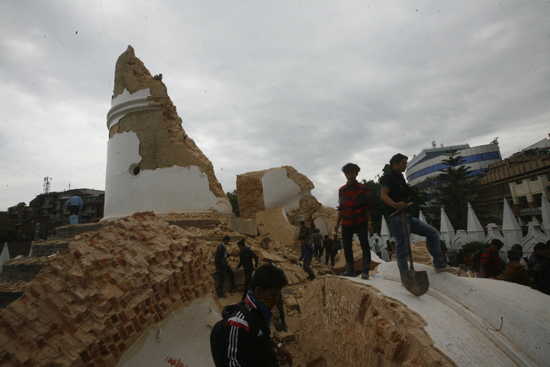 Nepali Times | The Brief » Blog Archive » Should Dharara be rebuilt? After 25 April earthquake, Nepalis were shocked to hear that the iconic Dharara tower in Kathmandu came down killing at least 70 people. It gave the first indication of just how serious the quake was, and also took away an important landmark that many had an emotional attachment to. Prime Minister Bhimsen Thapa built two towers in the 19th century both of which went down in the 1833 quake. Only one was rebuilt, and it was destroyed again in 1934 and once more rebuilt. Now, some are saying that since it had gone down twice previously, maybe Dharara should not be rebuilt, but the ruins kept as a memorial to the 2015 earthquake. There are many examples from around the world of destroyed monuments being left as a reminder of the disaster that caused it. For example, the Hiroshima monument has preserved a building, and parts of the world Trade Centre building have been kept at Ground Zero in New York. The concentration camp of Auschwitz-Birkenau is now a museum to remember the human cruelty. In Sichuan, some of the ruined buildings in Wenchuan commemorate the 2008 earthquake and the loss of life. The pros and cons about leaving Dharara as it is or rebuild it will probably go on for a while longer. What do you think? Should not be rebuilt in its present site but left as it is to commemorate the 2015 EQ. May be rebuilt at some suitable open space/park. Leave it as a monument to those who perished. Then rebuild close to it. Rebuild – as done before. I believe they should rebuild it and dedicate it to all those who lost their lives. It was an important land mark in Kathmandu. It stood towering over every thing else, it would be a shame not to see it again. I don’t see the point in rebuilding it, when so many other projects, that serve the people of Nepal, need attention and resources. As we are already in the process of building one dharahara inside the Naranhiti Palace Tukuchakinara ,there is no need of another one. Many thanks to the foresight of our “leader/s” that they have chosen this site. Sundhara can remain as earthquake memorial at the same time. Thy have left our stony mountain intact for the posterity. Now why not create a boulevard all around the Palace as the walls are fallen at many places We can beautify the city without causing hardship to the citizen-residents as done in the Singha Durbar periphery road expansion in the past. The bamboo groves can be cut down and can be used for Rahat purposes during the coming rainy days. It is a treasure. Why waste money on rebuilding a structure that collapses with every earthquake? Lets build schools & infrastructure with that money. it should be built for identity but not for trade. it shouldn’t be built in same location. Rather we should make Sundhara as a museum. Forget Dharahara. Clean the area. Build the park instead. You can name ‘Dharahara Park’.